Every year, 3 May is a date which celebrates the fundamental principles of press freedom; to evaluate press freedom around the world, to defend the media from attacks on their independence and to pay tribute to journalists who have lost their lives in the exercise of their profession. Series of events will take place in all Central Asian countries by making contribution to one hundred national celebrations over the globe. UNESCO leads the worldwide celebration by identifying the global thematic and organizing the main event in different parts of world every year. In the period from 4 April to 5 May with the support of the UNESCO Office in Almaty, United Nations Department of Public Information of the Republic of Kazakhstan, a number of international agencies and diplomatic missions in the capitals and regional centers of Kazakhstan, Kyrgyzstan and Tajikistan will be celebrating World Press Freedom Day (3 May #WPFD16) in the International decade for the rapprochement of cultures from (2013 to 2022). The events are organized by universities, journalist NGOs, training institutions and university librarians, research centers and the city administration. On 28 April 2016 International Foundation for Protection of Freedom of Speech "Adil soz", with the support of the UNESCO Almaty Office will organize celebration. 50 journalists, international and non-governmental organizations and students will participate in the event. 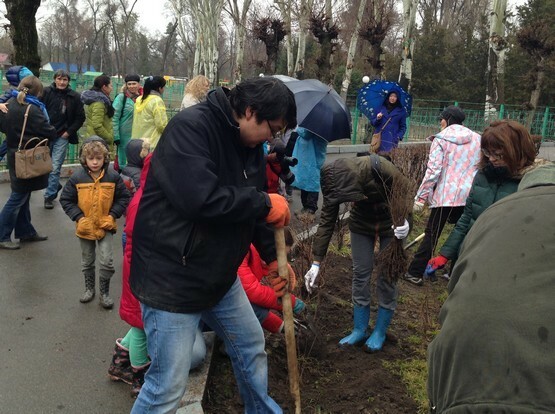 The press-conference will be held at 11 am at the National Press Club, at the end of the press-conference the planting of trees will be organized in one of the park in Almaty, Kazakhstan. The aim of the action is to improve the situation on access to public information and consolidation of the journalistic community for protecting their professional rights. The action is dedicated to the problem of the restricting of the provision of public information. May 3-5, 2016, with the support of the Shymkent city administration will be held Republican Mobile Media School "Shymkent - a city of sustainable development: media and information literate population." 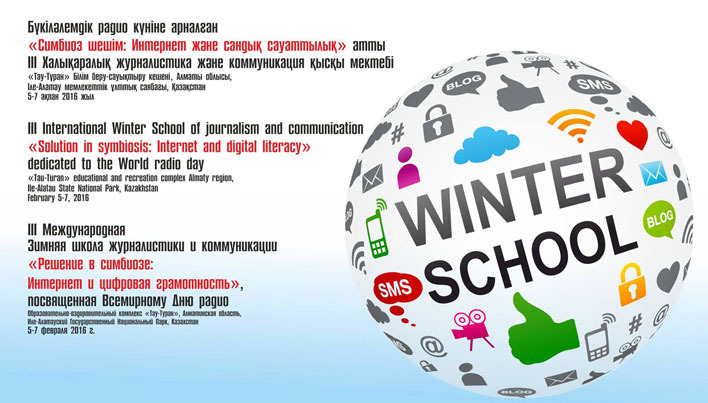 School Organizers: Center for training and accreditation of experts media "Journalist" at the faculty of journalism of KazNU named after Al-Farabi, the UN Information Office in the Republic of Kazakhstan, the press service of the Shymkent city administration. Mobile School will travel along the route of the six cities and villages of the South Kazakhstan region: Shymkent, Shayan, Shaulder, Arystanbab, Turkestan and Kentau and meet with bloggers, radio and television journalists and representatives of the local print media for the purpose of training covering media and information literacy in the context of the adoption of the law on access to information Kazakhstan and learning its application in practice. 5 - 6 May Suleyman Demirel University (SDU), in cooperation with the First President Foundation, Kazakh Union of Writers and UNESCO Almaty Office will organize a photo marathon "New World and photos", and two master classes on World Press Freedom Day, and the theme of access to information. The best photos will be posted on the main page of World Press Freedom Day Celebration at UNESCO. 15 April International Information Technology University in Almaty (IITU) conducts a special training session with the Journalism Faculty students, where they will role play for the real situation on access to information between government officials and citizens groups. Review and discuss the positive and negative scenarios of interaction and information providers Assignee: proactive publication of the state bodies of decisions by electronic means and challenging refusal to provide information to citizens. Discuss digital opportunities and barriers vulnerable groups in meeting citizens requests. The conference were considered acknowledged by the UNESCO standards, practices and techniques of international journalism, and the theme of freedom of speech and freedom of information; Media pluralism: Media as the trust instrument. Under the theme of Communication for sustainable development and current challenges were considered the role of Internet issues in civil society and democracy. Including legal regulation of the Internet. Questions journalist safety in conflict zones. International Days and programs aimed at the safety of journalists. The conference was attended by representatives of non-governmental organizations Medianet and Adil Soz, international organizations and consulates accredited in Almaty. 8 April was held the model UN General Assembly in the Kazakh-American University. 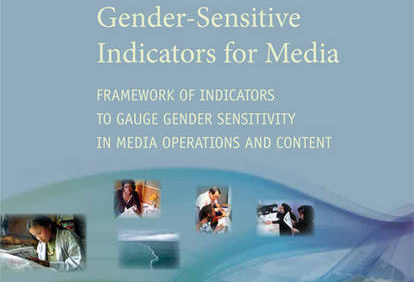 At the opening ceremony the representative of the UNESCO Almaty introduced Gender-Sensitive Indicators for Media: Framework of Indicators to Gauge Gender Sensitivity in Media Operations and Content, conductive to press freedom and freedom of information. Actobe, Kazakhstan: Course on Media and Information Literacy for Librarians. On 4-8 April, a course on media and information literacy was held with a special focus on freedom of information for the eleven librarians from Kazakhstan, including eight representatives of urban and rural public libraries and regional centralized library system of the Aktobe region. 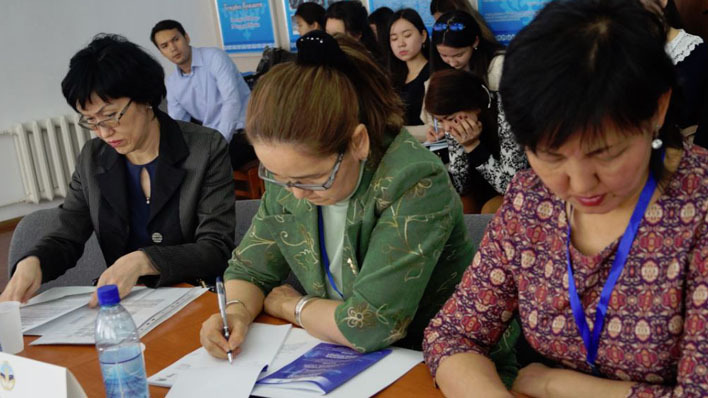 The course organized scientific information library service of the Kurmangazy Kazakh National Conservatory together with the Faculty of advanced training of teachers, with the support of the UNESCO Office in Almaty. This seminar is the first of a series of training activities for librarians planned by Kazakh Conservatory for the remaining 13 regions of Kazakhstan. 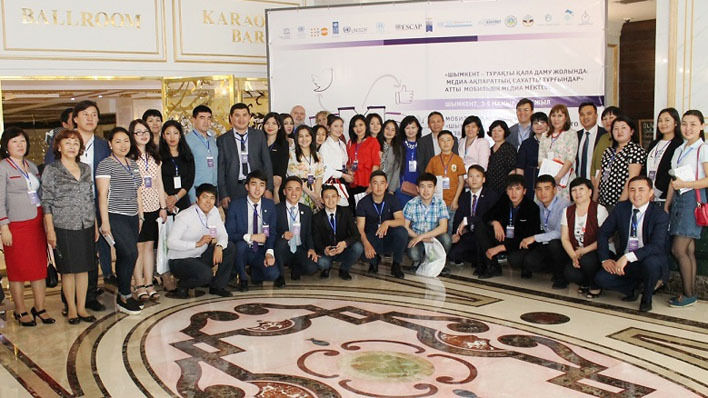 11-15 April 2016 Turar Ryskulov New Economic University in Almaty organized the conference While Creating bridges between countries in the intercultural space aimed at the integration of the international space. The UNESCO Office in Almaty in this regard, UNESCO presented the model curricula for journalism and Bioethics and Policy Open Education Resources. 30 April al-Farabi KazNU, Chair of print, electronic media and online journalism, jointly with the Department of Publishing and Media Design School of journalism organizing visual design contest on the themes of freedom of expression and information. Journalistic organizations and some media in Kazakhstan is actively supported in prisons colleagues, in this regard, 19 March 2016, journalists of the newspaper Nakanune.kz together with environmentalists held a rally #JournalismIsNotaCrimeDo not prison journalists - plant trees and supported by the journalist and his publication head of the Union of Journalists of Kazakhstan. 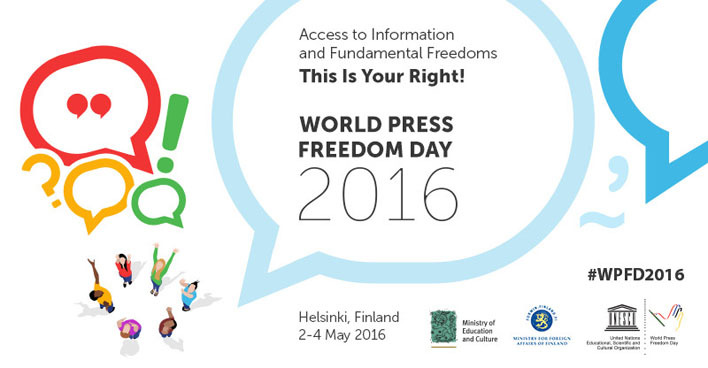 www.unesco.org: World Press Freedom Day in Central Asia 2016: Access to Information and Fundamental Freedoms: This Is Your Right!